The Clinical Audit Support Centre has gained experience over the years working with healthcare professionals and teams to run and implement a range of effective quality improvement projects. Although our work has focused on clinical audit we have used a wide range of quality improvement techniques to measure patient care. We are hugely experienced in gaining feedback from patients via bespoke patient surveys and running focus groups etc. We have been using the Plan, Do, Study, Act (PDSA) cycle and the Model for Improvement approach to conduct quick quality improvement projects, particularly where agreed standards do not exist. CASC staff are great fans of using run charts as these allow care and service delivery to be measured over time and recently we have done a great deal of work with general practices to help them reduce their patient did not attend rate. Both CASC directors are experienced QI practitioners: Stephen gained his Improvement Fundamentals certificate from NHS England and the Jonkoping Academy in 2016 while Tracy is currently a Health Foundation Q Member. The section below details how we support quality improvement initiatives. CASC offer a wide range of training options in quality improvement for healthcare. Typically, we deliver training in half-day or one-day courses and this incorporates the fundamentals in undertaking and project managing an effective QI project. 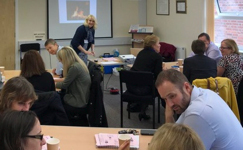 The training focuses on a wider variety of QI methods and uses interesting activities to stimulate learning. At present we only offer quality improvement training in-house. Contact us to discuss in more detail. We have significant experience in designing bespoke quality improvement projects for NHS and non-NHS customers. In recent years we have supported many teams to better understand and utilize QI methods with particular recent focus on children’s hospices and general practice. If you need to undertake a quality improvement project and require further guidance and advice, then please get in touch. Over the years the CASC team have simply picked up useful skills and contacts. We frequently help advise teams on best practice in quality improvement and assist them in agreeing a clear consistent methodological approach. We can also help advise on how best to integrate clinical audit and other QI approaches within the workplace. CASC also frequently help signpost those with an interest in audit to networks, providers and resources they never knew existed. In short, if you have a question in relation to quality improvement that you can’t answer, why not get in touch? With various quality improvement approaches and methodologies gaining momentum in the NHS and wider healthcare we are creating more and more resources and materials to assist those working in this field. Click here to see many of the materials that we have developed. The junior doctor section on our website also has multiple examples of QI projects that have made a difference and improved care, click here. In addition, we are always happy to help create bespoke materials and resources for quality improvement so please get in touch to discuss further.